The Soyuz for a planned Dec. 28, 2011 launch of six Globalstar second-generation satellites is shown following its erection over the Baikonur Cosmodrome’s launch pad. The launch of a Soyuz rocket with six Globalstar mobile communications satellites will go forward Wednesday despite the failure of a similar booster last week, according to Globalstar and Russian officials. The satellites will replenish Globalstar's fleet of communications satellites linking customers through voice and data messaging services. Liftoff of the Soyuz 2-1a rocket is scheduled for 1709 GMT (12:09 p.m. EST) Wednesday from the Baikonur Cosmodrome in Kazakhstan. Launch will be at 11:09 p.m. local time at Baikonur. 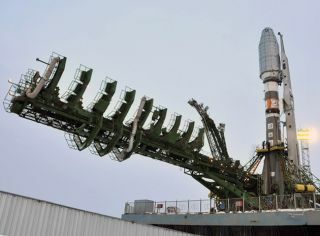 The launcher uses a different third stage engine than the Soyuz rocket that crashed Friday with a Russian Meridian military communications satellite. Investigators are still studying Friday's mishap, which caused the Soyuz rocket to fall in Siberia a few minutes after blasting off from the Plesetsk Cosmodrome in northern Russia. No injuries were reported, but some Russian news agencies said the crash resulted in property damage. The problem occurred about seven minutes after liftoff, when the Soyuz rocket's third stage RD-0124 engine was thrusting to propel the mission's Meridian communications satellite payload and its Fregat rocket stage into space. The Soyuz 2 configurations use modernized systems, but while the Soyuz 2-1b configuration is powered by a new RD-0124 third stage engine, the Soyuz 2-1a rocket employs the older RD-0110 engine used on previous launcher generations. Although both engines burn kerosene, have four nozzles and look similar on the outside, the newer RD-0124 engine uses a closed-cycle design, meaning hot gas driving the engine's pumps is burned with other propellant to increase the third stage's performance. The hot gas in the older RD-0110 engine is jettisoned overboard. The Soyuz 2-1a rocket also includes a digital control system, which allows the rocket to fly a larger 13.4-foot-diameter nose cone for commercial flights. Once the three core stages of the Soyuz finish their firings, a Fregat upper stage will guide the six Globalstar payloads into a 572-mile-high orbit with an inclination of 52 degrees. Built by Thales Alenia Space of Italy, the satellites will finish deploying from a specially-built dispenser at about 1849 GMT (1:49 p.m. EST). Two satellites mounted on top of dispenser will separate first, followed by the four other craft moments later. Ground controllers will place each of the 1,543-pound satellites on different trajectories to enter the Globalstar constellation. The process will include raising their orbits to an altitude of 878 miles and carefully piloting the craft into precise positions in the fleet. Globalstar satellites are divided among eight orbital planes to evenly spread the spacecraft across the globe. The Louisiana-based company's subscribers use the satellite network to make mobile phone calls and data transmissions, especially in rural zones where terrestrial coverage is spotty or non-existent. Wednesday's launch is the third of four missions to bolster Globalstar's satellite network. Six more satellites are due for liftoff on another Soyuz booster next year, following up on successful flights in October 2010 and July 2011. Some of the 12 fresh satellites launched in the last two years have shown signs of trouble with their momentum wheels, which maintain the craft's orientation in space. The anomaly manifests itself with increased friction torque in the rapidly-spinning momentum wheels. Thales was tasked by Globalstar in November to develop software patches to restore satellites with failed momentum wheels to full service for their planned 15-year design life. Each spacecraft has four wheels, but they currently need three wheels to provide communications services. The software would allow each satellite to continue operating with two functioning wheels. Inspections of the satellites to be launched Wednesday led Globalstar and Thales to switch out one of the spacecraft for a spare scheduled for launch next year. S-band antenna degradation on Globalstar's first-generation satellites has limited voice and duplex data communications since 2007. The problem has not affected Globalstar's simplex data relay and asset tracking products, according to the company. The new satellites are gradually restoring voice and duplex data service as they join the network. Controllers are retiring the old satellites as fresh spacecraft enter service.